Birds of Paradise raises 100-150 exotic baby birds each year. 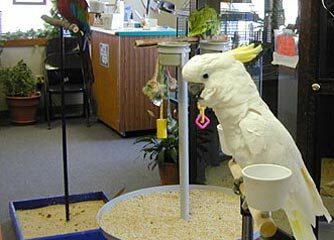 If you're considering a bird for a pet, Birds of Paradise encourages you to come in and get to know your new pet, as well as learn the proper way to care for your new family member. You will have plenty of time to think about your purchase and to ask any questions you may have. While making your decision, the baby bird will become accustomed to you and you'll learn how to give it the best care possible. You'll also be able to take photos of your baby bird as it grows. All of this helps make the transition from the store environment to your home easier for you and the bird. All birds at Birds of paradise come from a private circle of people who provide the best care for them. Group tours are available for schools, senior groups and others who would like to learn more about specific topics or for just an overview. We also furnish some birds for special events such as weddings or parties. Birds of Paradise carries a complete line of cages, food and toys and has numerous breeds of birds for sale including: Finches, Canaries, Budgies, Lovebirds, Cockatiels, Conures, Amazons, Macaws, Pionus and more. Ask about our bird Bed & Breakfast where we can board your birds any day of the year. Including holidays! Our low cost grooming service keeps your bird in top condition, pampered and looking good!